1. Spring is synonymous with “new beginnings”. There’s something extra special about getting married during the spring months. The season is all about rebirth and renewal, which makes it the perfect season to start your life together as a married couple. 2. You’ll have the choice of swoon-worthy color palettes. With combinations like pastel pink and bright purple, pale gray and ivory, pale pink and cream, and mint and coral, you’ll be spoiled for choice when it comes to your wedding colors. The lighter, brighter tones of spring are oh-so-feminine and bound to make any wedding look chic. 3. It’s the perfect “Goldilocks” temperature. Let’s face it, most of us dream of a wedding day that’s sunny and mild, yet not too hot or too cold. Spring is the perfect season for an outdoor ceremony. Dreaming of a beach wedding? The fresh, salty breeze is heavenly in the spring. With so many flowers in season during the spring months, your options are nearly endless when it comes to your bridal bouquet. Peonies, calla lilies, hydrangeas, tulips, and roses are some of our favorite flower choices for spring wedding bouquets. But, if flowers aren't your thing, spring is also a great time to embrace greenery like succulents, moss, and fresh herbs. 5. Spring attire is absolutely gorgeous. Your bridesmaids can wear gorgeous pastel colors. The groom can wear seersucker. The best part? The bride can comfortably wear any style dress. Backless? It won’t be too cold. Want to channel Meghan Markle’s iconic long sleeve gown? It won’t be too hot. There aren't as many conflicting holidays and vacations as a summer wedding. Bonus: If you’re planning a honeymoon straight after the wedding, you’re in luck. Spring is one of the best times to get away. Prices are still reasonable – as the kids aren’t on their school breaks yet and a huge number of destinations are at their best. It’s a great time for a Cape Cod honeymoon, too! The Dan’l Webster Inn is ready to help you craft unforgettable memories to last a lifetime, any time of year. Spring, summer, winter, fall - we host weddings all year long, offering unique and customizable experiences that you won’t find anywhere else on Cape Cod. Choose from three exclusive wedding packages, each specially designed to relieve you of the stresses that are often associated with organizing the most precious day of your life. We want your wedding to be as perfect and carefree as possible. It’s all here for you at the Dan’l Webster Inn – elegant options for the ceremony and gorgeous spaces for your pre-ceremony events and reception, lavish menu options carefully prepared by our award-winning culinary team, and exceptional overnight accommodations for your out-of-town guests. Our full-service spa is here for your convenience. Visit before the ceremony to be pampered. Have your hair and makeup done the day of, and, after the wedding, the bride and groom can relax and unwind with a couple’s massage. The Inn also offers gorgeous options for your ceremony, indoors and outdoors. Say “I do” in a garden surrounded by colorful spring blooms. Or, if your dream is a romantic wedding ceremony by the water, the picturesque Sandy Neck Beach is just down the street from the Inn. Have an elegant reception within the grand glass walls of our conservatory, or the in the magnificent music room. All wedding packages include a wedding cake, a wedding toast with champagne or sparkling cider, a chic banquet room setting, a lavish full-course wedding dinner, discounted room rates for the wedding party and out-of-town guests, and complimentary reception room for rehearsal dinner. In addition, each wedding package includes a banquet manager to ensure your day goes flawlessly. At the Dan’l Webster Inn, everything is easy, centrally located, and all in one place, so you can relax and enjoy your special day. 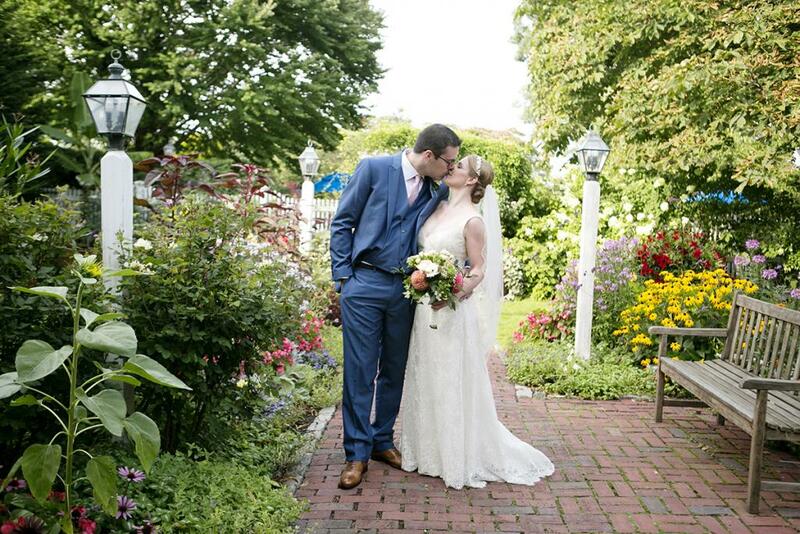 Contact us today to start planning the Cape Cod wedding you’ve always dreamed of.